If you remember those few words you know who said them and why! Laurel and Hardy movie scene. Part of the fun of growing up is hopefully creating memories that last a lifetime. 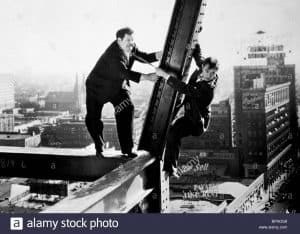 Dating myself a bit, no keener memory was when watching the antics of Stan Laurel and Oliver Hardy the hilarious comedy duo, and yes, Ollie (Oliver) said those words. As a kid either at the theater or on television at home watching them in one of their classic movies I enjoyed their zaniness, perfect comedic timing and action that created barrels of laughter. And speaking of barrels, Oliver Hardy was the rather rotund half of the team, as Stan Laurel was on the thin side, to say the least. Today with the wonders of smart television, YouTube and Netflix you’ll have a great afternoon or evening of viewing. 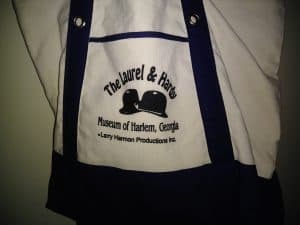 While Stan Laurel was born in England and raised in Scotland, Oliver Hardy was a “good ole Georgia boy” born in Harlem, Georgia and guess what?……. that’s where the fun Laurel and Hardy Museum is located. 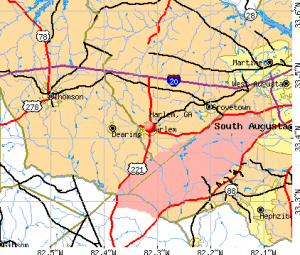 Charming Harlem, Georgia is outside Augusta (of golf fame}, in fast-growing Columbia County, Georgia. 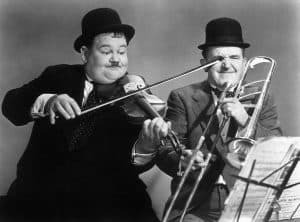 Stan Laurel and Oliver (nickname Babe) Hardy were one of the most famous comedy teams in the world during their twenty- five year run from 1926 until 1951 when they both semi-retired due to illness. The boys are still a favorite today when selecting older comedy movies to watch. Hardy died in 1956 and Laurel in 1965. Pose with your famous drivers! Entering the museum, you’re greeted by life-size cutouts of Ollie and Stan and it’s your first photo-op! A feast for the eyes follows with awesome memorabilia from their over 107 films on display including their trademark bowler hats. Our favorite “memento” was taking photos sitting in the back half of an “old 1930’s convertible automobile“ while Ollie and Stan drive! One of many exhibits at the Laurel and Hardy Museum. 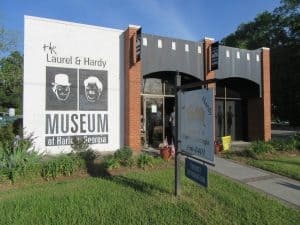 The museum also has a small “theater” where during visitor hours some of the classic Laurel and Hardy movies can be viewed on a large screen. It’s easy to find just follow the viewing visitor’s laughter. The museum staff and volunteers are very welcoming with a wealth of information and interesting bits. We enjoyed hearing them answer questions from other tourists too. There is a small gift shop to pick up souvenirs. Souvenir Laurel and Hardy Tote. Here is our often used tote. 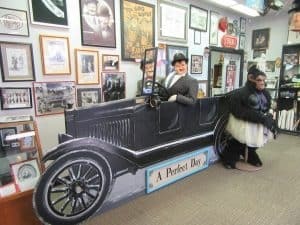 Every fall you can celebrate and remember Oliver Hardy at the Oliver Hardy Festival, along with 35,000 of his other fans in Harlem, featuring a parade plus fun-filled activities for the whole family including a Look-A-Like contest, music, arts, and crafts. Of course, food and Babe’s Bijou Movie Theater. (Babe was Oliver Hardy’s nickname). Check the museum website or Facebook for exact festival dates. Accessibility is quite good with a flat sidewalk up to the front door. The museum is probably a little tight for an electric scooter and impossible if crowded. Exhibits can have some smaller details although space is bright and well lit. Restrooms are on the main floor but I’m not sure of door width. Allow about an hour for your visit depending on interest and if you watch some films. Free entrance/donation. Free parking. 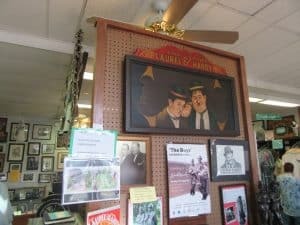 For a few laughs for new and old fans, the Laurel and Hardy Museum is well worth coming off the highway for a visit. Hours: Check website or call.